“On July 22nd 2011, Norwegian fascist terrorist Anders Behring Breivik killed 69 youngsters at a camp of the AUF youth wing of Labor – the leading government party – on the island of Utoya. This camp served as a venue to inculcate party ideology into the minds of children from 14 years and up. Later it became known internationally that part of this included promoting anti-Israel sentiments.” Ivar Fjeld is a gentile Norwegian journalist. 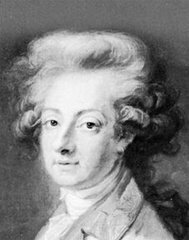 He was formerly a local leader of the AUF and was media advisor to Labor politician Olaf Akselsen when he was minister of Oil and Energy in 2001. His book “The Red and Green Terror Island” was released at the beginning of 2013. It discusses the history of what happened on Utoya Island. “I was raised in a traditional, secular Norwegian family. Until 2004 when I re-discovered our Christian origins, I was an admirer of Yasser Arafat. We were however, always moderates and never believed that violence should be used as a political tool. At a certain point in 2006, the AUF broke away from its moderate traditions and turned sharply left. “The AUF owns Utoya Island and its facilities. As a local AUF leader, I participated in this camp in 1986 and 1987. Even at that time there were Palestinian participants. They used drugs and shared them with Norwegian youngsters. We complained about it to then-Labor Youth Secretary General Mr. Stale Dokken, but he and his colleagues preferred to hush it up. “At that time, Jens Stoltenberg, the current Norwegian Prime Minister was head of AUF. He must have been aware that Palestinian ‘guests’ were smoking pot on the island, and offering drugs to 14-15 year old Labor Youth members. In my 2006 book "From Atheism to Christian Faith", I mentioned this drug scandal. I gave a copy of my book to Stoltenberg. He sent me a hand written thank you card back. I am not sure whether he ever read the book or not. 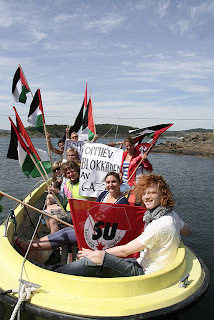 “In 2007, the AUF began to rent out the facilities on Utoya. As an ideological movement, they should have been selective about to whom they were willing to make the place available. One of the organizations to which it was rented however, was the youth movement of the small Norwegian communist Red party (Rodt). Its members included Leninists, Marxists and Maoists. “The Red youth movement invited youngsters from the Palestinian Popular Front of Palestine (PFLP) to participate in their camp. The PFLP is listed as a terrorist organization by the United States, the European Union, Canada and the U.K. Money was collected for the PFLP at the camp. I have documents and pictures which prove this. “At Utoya’s 2011 camp, Israel was also demonized. This was done by AUF leaders and visiting anti-Israel lecturers. There was a huge banner calling for the boycott of Israel. There were many countries they could have called to boycott with far more justification, but as usual, they chose Israel. 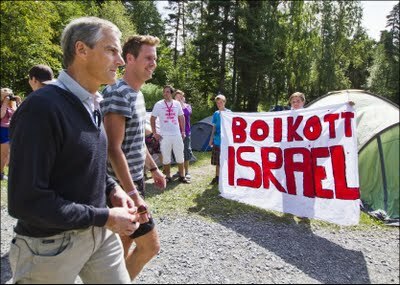 When then-Foreign Minister Jonas Gahr Stoere visited Utoya, he spoke out against the boycott, yet was photographed in front of the boycott banner. Stoere said that Israel’s fence should be dismantled, knowing well that this would lead to increased terrorist attacks. “There have been unconfirmed reports that youngsters in Utoya were taught about how Palestinian freedom fighters are trained to handle Israeli soldiers. * Dr. Manfred Gerstenfeld has been a long-term adviser on strategy issues to the Boards of several major multinational corporations in Europe and North America. He is the Chairman of the Board of the Jerusalem Center for Public Affairs. It's great to see this blog up and running again. I was wondering if there were any focal points (however small) for pro-Israel sentiment. Camps or youth movements belonging to other parties, for instance.